Since the EA can open a lot of trades, it is recommended to use an account with a high leverage (1:500 is recommended); or you can use a bigger account balance, or use a cent account. It's heartbreaking to give this EA a negative review as I know how hard Wim has worked and for the professional support provides all users. However, after running Momentum EA in full conservative mode for over a year at lotsize step 3000 (on IC Markets, AUD account, so MaxDD expected ~40% when backtesting at beginning of the year) I currently sit at 80% DD after a year well worse than the backtests. For this reason I have to give a 2 star rating. 1/5 for EA performance and bonus star for Wim's support. So far in 2019 performance has continued to deteriorate to the point where I have had to cease trading the EA for now. Will re-consider if there is a significant update in the future. It`s been well over half of year of me using Momentum EA, so I think it`s time to write a review regarding its performance. So, I did a little exercise - turned off auto settings and ran optimizations for 10+ years for both strategy A and B for each pair (usually up to mid 2015) and then tested on out of sample data the sets which had at least 130-150 trades. Unfortunately, for the majority of pairs the optimized sets gave completely random performance on out of sample data (2003-2005 and 2015-2018). However, if you do that exercise with EURUSD M15 Conservative Strategy A and EURUSD H1 Aggressive Strategy A and B - almost every optimized set continues to be profitable on the out of sample data (and only few of them were flat). You can also easily see my point if you look into the Statistics tab on the performance of the monitoring signals. So Momentum EA is worth it if used on the above sets/strategies. Since a few weeks this EA works on my Real money account. It's a great EA with, and this is a real good thing again, a lot of possibilities of different settings. Since this EA runs on my Live account, it produces money, real money and i don't understand people they just giving 1 or 2 Stars for this EA. Including the very helpful support this EA deserves 5 Stars at least. As i feel responsible of my rating which can have influence of the idea of a trader for this EA i'm convinced to need to do a downgrade of my rating i did before: i don't do that because of anger or fury but as summary of the functioning of this EA which created a DD of about 30% in my Live Account by using conservative settings within the last 4 months. I will update my rating within 3 months as i'm still believing that this EA get's a better time again. 1 Star for the Author as he's always improving his EA, 1 Star for the EA as i'm convinced that it's having a good Come Back after a while. For general understanding read also some other comments of traders. One Star rating as the developing of a new EA seemed to be more important than improving the existing ones; more than 50% DD since January with BOA Mode and conservative setting. Sad but true. He's always optimizing and optimizing to make the backtests perfect and smooth. Live trading is something else. Always comes up with something new, All in one mode, Ultimate portfolio but the signals with 60% loss he deletes and he just makes new ones. Never been profitable for me.. Wast of money. Dont trust this guy, You see all ppl reviewing 30% drawdown but on the back test you wont see a 30% drawdown because he optimizes it away. Also promotion here, promotion there. I believe if the ea is good it sell's itself it dont need promotions.. I'm using this EA for about 6 months and I'm still in drawdown (using mostly M5 and H1 conservative). It seems to work well on EURUSD though, so I will make some changes to my portfolio and hopefully get out of drawdown. Trade rules are very simple.But it is very profitable. Perhaps it will be useful for a long term. The reversal deal is very powerful. Even if the first position becomes SL,the reversal position will recover the loss. Update: King of Unrealized profit.We always need to think about profit taking. Update: I think it is necessary to reverse the direction of the position and TP and SL. 2018 05 02 update: Well time to put this back to 5 stars. This EA certainly have gut wrenching strategy to watch. We had a pretty good sideway market for couple of months, which slaps this EA around real hard, you can check author's signal. However, you can reduce the drawdown a bit if you do your own due diligence by selecting pairs/ strategy/ set to run, at the cost of reduced profitability. 4. Although this EA has not made any profit for me yet (currently its in DD period Dec 2017-Feb 2018),but i think i found a right setup for me and should recover soon. 3 stars for the support and professionalism of the Author, Since i only run this EA for a month, its too soon to judge if this EA is good or bad, considering its a long term EA.I will update again in a few months. 2018 09 14 update: I still hate watching this EA trade, but the EA works. Update 13.09.2017: Wim's support is just great!!! He answers very quickly and helps setting Momentum up properly. Update 14.02.2018: removed conservative M5, M15, M30, H1 because I hit the maximum of pending orders. If this does't help, I'll only run ultimate portfolio. Update 30.06.2018: Using M1 and M5 Conservative only, Works great! 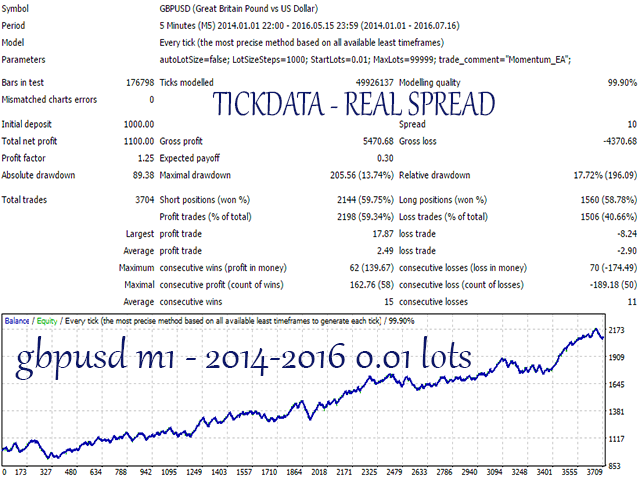 Works for a great variety of pairs and for several timeframes, real trading shows excellent results, author is passionate and updates frequently! Update: I had high hopes for this EA, but after running the Ultimate portfolio for over 2 months I think its time to stop the bleeding and give this EA and my account balance a rest. DD in excess of 30% over a short period of time is a bit too much to bear. Problems that I see is not being able to hold onto profits when they arise, and getting stopped out prematurely only to see the trade run in our favor. I have noticed on occasions that the SL is placed incorrectly - just where the stop hunters would look. Also, the profit targets are trying to reach beyond obvious Support and Resistance levels which means TPs are harder to come by. I do appreciate that increasing the stop loss and reducing the TP targets may not be optimal for overall performance but robustness of strategy should take precedence over "optimized" profits. Obviously, I am deeply disappointed with these results, but I believe the author is highly skilled and dedicated and I am hopeful that if the EA does not quickly recover, solutions will be found. Update 30/3/18: See my comment #2241 - Have the solutions been found? Is it too early to get back in the water....? Bought this EA, was running default settings (conservative mode) for over a month now. It's burning money at an astonishing rate. Loses, loses, loses. And more loses. Removed from real account, but will keep an eye on how it does on demo. Even it recovers - it's trading style is hard to live with. Here to strenghen the review given by Aussie_Trader: developer appears skilled and very open to support, but as for the product itself I actually, running fixed lot 0,01 Aggressive mode, am at an ashaming minus 33%. Like Aussie_Trader stated, SL are too close to entry point and TP are too far from it. This generates always a positive difference between Equity and Balance but the sum of the closed trades (mostly by SL hitting) in a day is negative. Maybe it's time for developer to optimize it, in the meanwhile I removed. Some month ago I have lefted a very bad review about MomentumEA, because I got a big losses over some thouthand dollars during. But now I have changed my opinion: MomentumEA good system if you adapte it for yourself. First of all, you haven't use all pairs and strategies - over half of pairs (I have lefted only 5 pairs for second strategy) have a very bad results in longterm. Conservative settings have maken EA more stable and safety. So now I have a stable 2-3% per month since July (0.01 lot per $10 000) and now it's correlated with the backtests. I am using MomentumEA since the March 2017 and I am still cannot cover Drawdown. His support and response is gold! I'm using this Expert since Product starts, so there where some little things to optimize to grow and make this Product strong and balanced. The latest Version is absolutely great, so Wim was able to do with some steps a one of a kind product. I recommend this product fully, for all kind of portfolio's. Thanks you Wim, for sharing this prouct with us. I'm using this EA's since january 2017. I can tell you It really is one of the best "long term" EA's I've tried so far. This EA's does exactly what it said it will. Wim is nothing else than awesome. He is professional and gives very good support if you need it. I'm also using his "GBPJPY Price Action EA" ... This one works really good too. Nice job Wim, keep it this way. Time to re-evaluate the EA: Bringing two stars back up to five. 19/10/2017 After initial hick-ups and extended stagnation periods, Wim has continued to improve this EA and new version 5.0 and conservative settings give good probability of profitable performance going forward. H1 and M30 normal risc are stable and profitable in backtest and live. M5 and M15 in conservative risc are OK too. The best EA I have found so far, and I have tested a lot. Great developer, highly professional, in the market from long time and here to stay. Great support. The EA has a very solid strategy behind and is showing on many real accounts the ability to make profits. same as below, loss after loss, slowly taking all your money for more than 6 months , Wim doesnt bother to reply to my message, not sure what has happened. The EA opens on single pair 19 long and 17 short trades, this is not good enough to make profit. I was fooled again, also with modeling quality in % as attached in description also with other Wims products... one star for trying Wim.. TERRIBLE EA! Every year Wim has an excuse about why it's not performing well. Don't waste your money. Look elsewhere. Good. This EA wins on price fly away crying headache situations where other EAs hit SL. Added to my portfolio. What is the difference between Momentum EA and Martingale EA ? Martingale wins a bit and then looses a lot. Momentum EA looses a bit then wins a lot. Why ? Momentum will follow the trend, Martingale crashes against trend. Update 28.04.2017 : one of the best EA. I cannot understand the negative comments here. Be patient, do not interrupt, do not overload with wrong (big) position sizes). Very profitable EA. Wim is very professional developer. 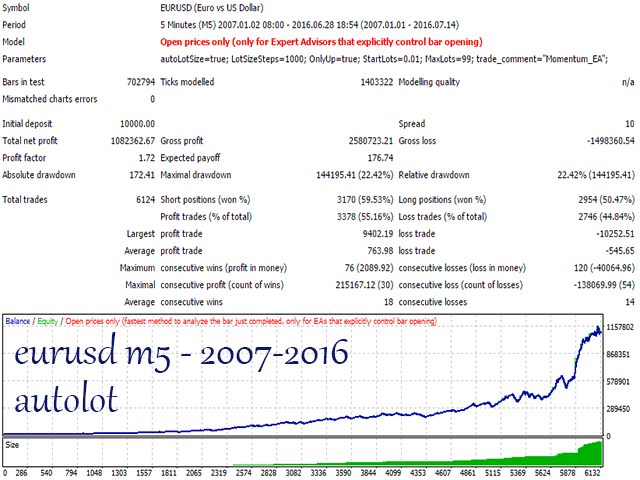 Top EA on MQL5. Wim's help and support is excellent. As I understand it, the positive feedback this has worked well in the past (a good test), and, in the opinion of the Creator in the future (long term expert) )) Like a real user of this EA, can report about the real picture of the present time: earns a month, for a week and loses even more. If the Creator of the EA right about the long term, rent is not suitable at all! Extend the lease at current losses will look like attempt to win. This EA is the best I've ever seen. I have developed EA's, and I do know that the only way to create a profitable one is to have dynamic entries and exits which Wim coded beautifully. Most of the haters are expecting a strategy which never loses. Wim's EA does have losing streaks, but in the end it is a very profitable strategy. And Wim is very patient and answers all questions you may have. I have been seeing some negative comments regarding this EA and I would like to share my experience. Firstly, if you have thoroughly back tested the system and then started to get wildly differing result while running it live, you have a reason to be pissed off or angry with the product. If you did not do your due diligence with testing the system, you have no reason to be angry. It is your fault for not testing and finding what the largest draw downs, losing streaks, ect are. Before I purchased the EA, I did extensive testing with it in the backtester to figure out if it was really worth my time and money. 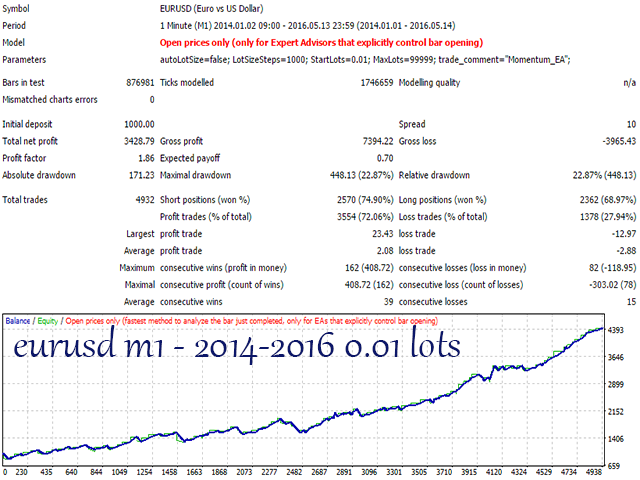 I found that if I ran it on only one pair, EURUSD H1 and only strategy 1, the EA would produce results that were within my appetite for risk. After purchasing it, I retested to make sure my results were similar and I found no major differences. For the testing, I ran it with a $5000USD account and a 0.10 Lot size so that each pip would be worth $1 USD and I ran the tester on every tick to try and be as accurate as possible. Therefore, I could determine the pip values for each period I tested then apply my own money management after. I am going to post a spreadsheet of my monthly results below. 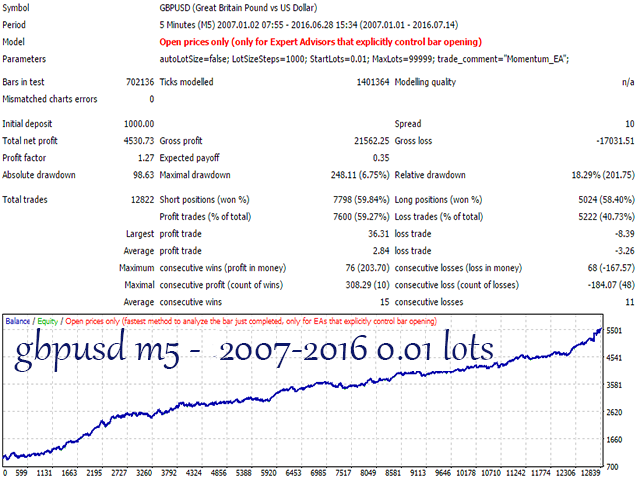 Notice that if you were to run the whole test from Jan,1,2000 to the date in which I stopped, the total amount is off by about 400-500 pips. This is my margin of error that resulted in testing each month Individually and not just testing the period as a whole. If you have any question, comments or concerns, dont hesitate to ask. These results are my personal testing. Please do your own testing and dont copy my results. The system works best in trending markets and needs to be run over a longer period of time to show off. I rented this for three months. Wim offers no support. The EA will look good on the backtest but on a live account it will just lose your money. It opens multiple trades for the same pair in both directions hoping to catch a trend but the trade will always hit the stoploss. More and more posters are catching on about the poor results of this EA. Here is my experience on both live and demo accounts. The reason it's on sale is because it's results aren't as promoted in the unrealistic back testing (which is always the case, not just for this EA ), but also the mediocre live fx book results (a fluke period perhaps?). The losing trade rate was typically around 95%. In its best week it maybe lost only 75% of trades. 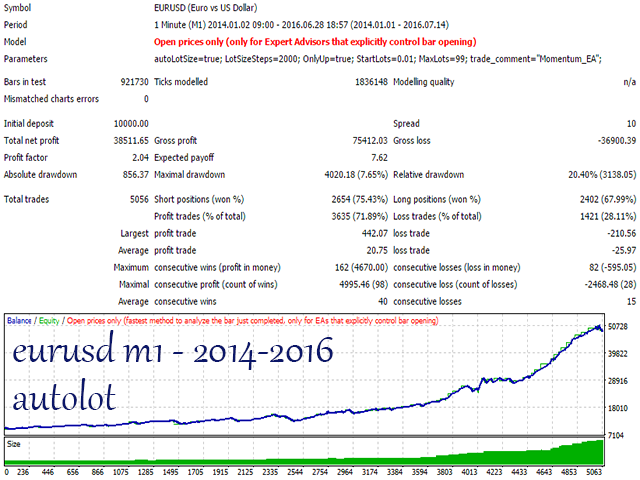 I ran it for almost 2 weeks on a live account and it chewed through $700 using confirmed settings and autolot sizes. After this it was switched to a demo account for the last 3-4 weeks and its loss rate hasn't improved (using only the H1 "less risky" setting) any and it has chewed through another $2000 of fake money at least now. The claim that this software hunts down strong price movements is only correct in that it will pile on trades to price movements that have already happened, expecting that there'll be a bigger trend (it relies on the mega movements that shock the markets every few weeks or so). In reality what happens is it opens trades at the peak of a movement (or trough) and then with the inevitable pullback all of those piled on trades tap out on the stoploss. It is claimed that the software can be controlled to only have two trades open per currency pair (that is you flick off strategy two), I have not found this to be the case with it opening 3,4,5 trades late into a price movement and then all tapping out. It typically magnifies losses in uncontrollable manner, I can trade manually better than this thing and have since recovered my losses with signal services and my own trading. With the strategy that sets up staggered buy stop and sell stop orders, it even ended up opening a buy and a sell order on the same currency pair simultaneously at the top and bottom of a channel (it supposedly doesn't do hedging). The type of price movement needed to make such trading profitable would be like winning the lottery. The live FX books results show a four-month period where it was profitable (this must be a fluke period). Have a close look at those results and see that 85% of the total profits in a four-month period were accumulated on just seven days. That isn't the results of an algorithm that is working well, it's essentially relying on market shocks and piling trades on late to possibly get by in the long run. I wasn't expecting it to be magical, but I did expect it to function with a winning trade rate that is at least within the same order of magnitude as is promoted in the backtesting and fx book results (call me crazy). Watching this thing trade is pure chaos, like a monkey is hitting buy/sell orders on the keyboard. You will pull your hair out watching it pile on trades late into a price movement that you know is about to pullback. This guy talks a great game but don't let him pull the wool over your eyes and claim that changing lot sizes is going to affect the viability of an EA that typically has a loss rate of 90+ percent of trades. No amount of account management will sustain such a loss rate. And don't let him tell you that "it's the markets fault" for not moving much this week when it opens a tonne of trades late into a price movement that pullback and tap out. I wasted 750 USD, don't even bother renting it. I lost today as much as I gain in the last week. Worst ever, i have lost 300$ today!!!!!! i want my money back. I trade since 8 years ago in forex, as much of the people at begging I already passed the dream phases where I believe that few usd cost scalping EA or few eur martungale systems could have made me rich in few time. Thanks to had suffered more than one full account blowing I quickly realized that to achieve reliable long term results in trading is an hard work in any case ! 1) If you want to do it manually you need to lear a lot about strategies and tactics and stay in front of you compututer at least few hours/day. 2) If you want to use automatic trading system, then it is not less hard because there you will find tons of "fantasic promises" that at least 99% of the cases will not be kept or will have hidden risks, and this means may be you will see very nice profit for few days or few weeks or even few months, but some morning you will wake up and will find your balance at zero. Then I choose the second option and decided to really learn how to evaluate a trading system. 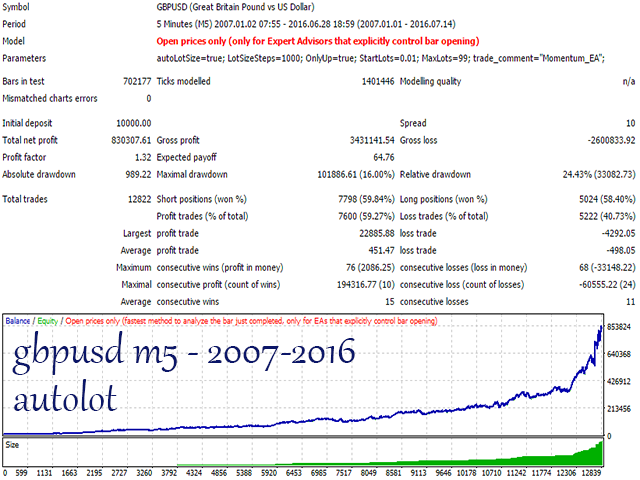 After this several years study, I am able to select very few (but excellent) EA to put in my portfolio, trading live account and see my profit grown month after month. 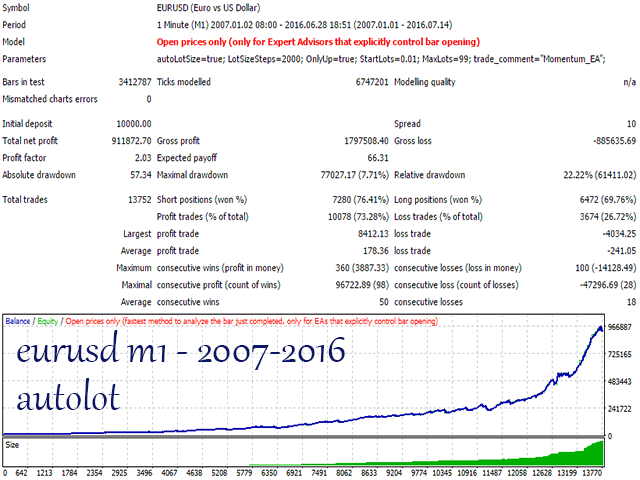 A selected Momentum EA as one of my most favorite EA in my portfolio, and want to share with you the most important point in my checklist that Momentum EA passed and, according with my experience, this are the key points to secure, first of all really control of the risk and be sure I can always forecast the maximum drawdown that I am prepared to accept, second, as logical conseguence, I will see my profit expectations fullfilled. These checklist aim not only to see the profit potential but, more important, the stability od teh results in the past that is the most logical metrics to keep expectation for the future. I suggest who is considering to buy sume EA to check if it fullfill the ALL the following points. 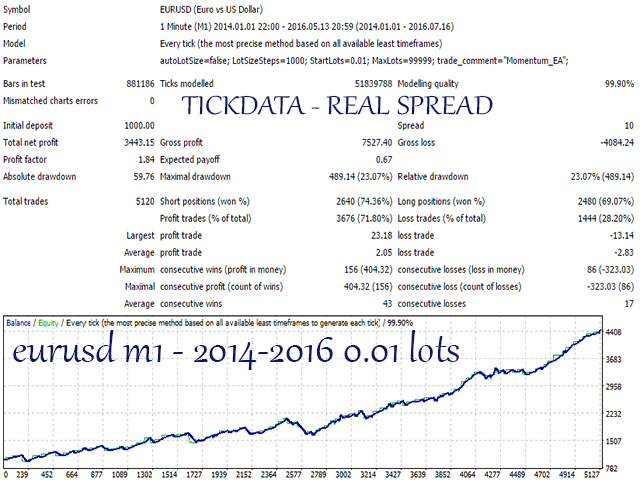 I did it with hundreds of EA in mql5.com market and Momentum EA is the only one that mach all !!! So as a christmas gift to all of you that will avoid you to avoid lose money in buying not good EA, to avoid you to lose a lot of money in using not good EA and will you to realize why Momentum EA is a really professional trading system where you can keep serious expctation for the future. In coonclusion I want to adda than for me Momentum EA fullfilled all these points already with verion 2.9, with the new 3.0 versione and great improvement on H1 timeframe, Wim did an even better job an all the previous parameters now are even much better the minimum required threshold. So it is up to you decide if Momentum EA is for you or not, but I am sure it is great for me and I need to thanks Wim one time more for his great job. So far so good. An impressive EA, but the most outstanding thing is Wim's help and support in getting it up and running, his quick responses to queries. Unrivaled professionalism along with a very solid product. Patience paid off good..a good EA. I made at least 10x of the price I paid..Wim has been very nice and extremely supportive. Simple but effective strategy and great support by Wim! and for making such a great EA. Wim is really professional in his work, and from his EAs, you can see it is really a QUALITY EA. You can see he is trying to make sure the EA works well in default without optimization for anyone to use. As it is relatively new it will take me sometime to review again to see if backtest matches live forward tests. As usual, will review in 6 months time! Great support and communication from Wim as always! - Added new mode "Best Of All", which will run the best sets on the best timeframes for each of the optimized pairs. 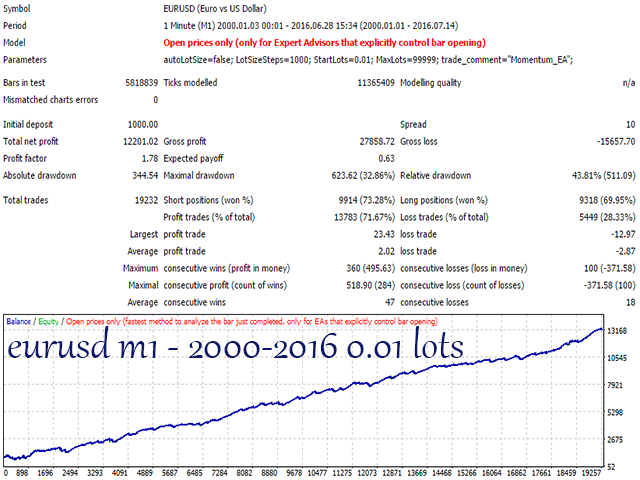 - Fixed EURUSD H1 Strategy B Aggressive mode. The EA was using wrong settings for this. 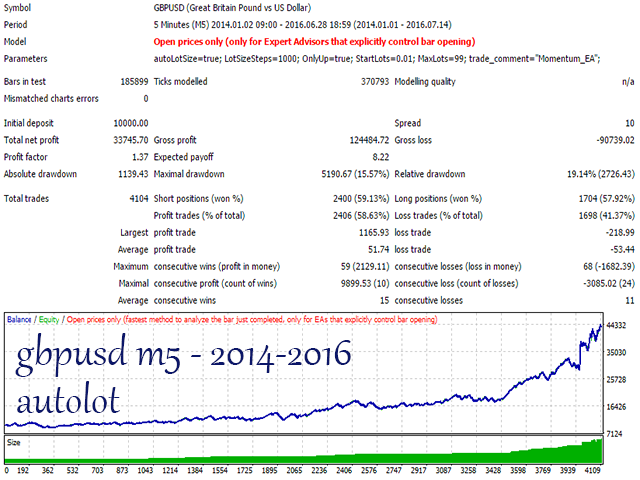 - Improved and balanced operation on EURJPY M5 and EURGBP M5. - fixed problem of some brokers not putting trades of bigger lotsize.